President Donald Trump came into office with a clear message: He would do away with his predecessor’s health care law. But a growing number of U.S. voters may not be on board with that plan, according to Morning Consult/POLITICO survey data. 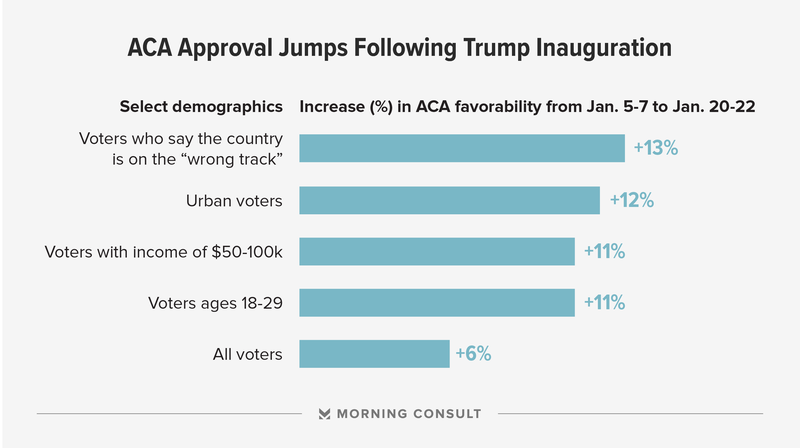 Approval ratings for the Affordable Care Act jumped to 47 percent immediately after Trump came into office, up from 41 percent at the beginning of January, prior to his inauguration. That compares to 45 percent of voters who disapprove of the law, down from 52 percent. 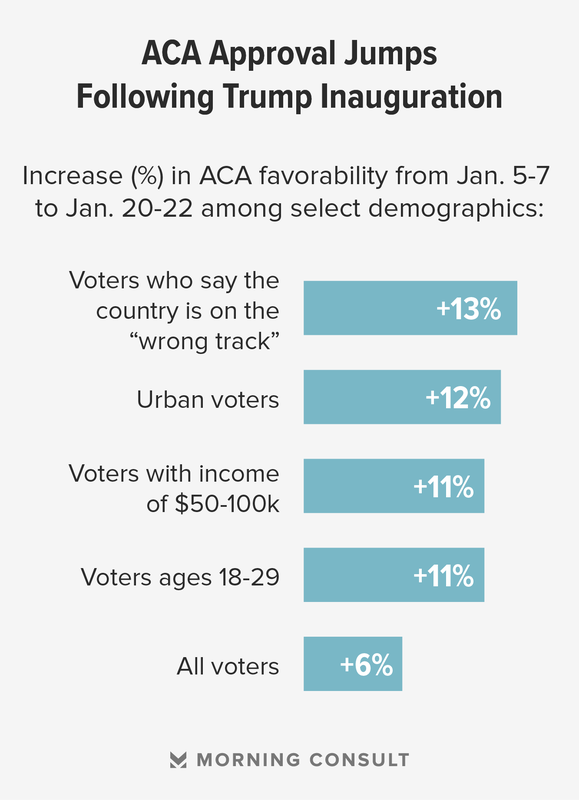 The spike was particularly pronounced among people who say the country is on the “wrong track.” Fifty-two percent of people who chose that response now approve of the ACA, up 13 percentage points from the prior poll. Approval numbers also went up more than 10 percentage points among people who care about health care, urban voters, those in the middle class and young people. On his first day in the Oval Office, Trump signed an executive order instructing federal agencies to relieve Obamacare’s “burdens,” which was an interpreted as a way to weaken the law’s individual mandate. Several lawmakers have rushed to propose alternatives. But the heightened focus on the ACA may also have a flip side, said Paul Ginsburg, director of the Center for Health Policy at the Brookings think tank. Thomas Miller, a health policy expert at the American Enterprise Institute, a conservative think-tank, had a different take. He said that coverage about the health care law had transformed since early January, focusing more on instability and the issues facing Republican repeal plans rather than on earlier problems with the ACA itself. “People respond to what they face as risks,” he said. “It’s not surprising there would be a change in [public opinion] at the margins.” He said it was unclear whether higher approval ratings for Obamacare were short-term, or reflected a deeper shift. The survey polled 1,992 registered voters from Jan. 20-22 and has a margin of error of plus or minus 2 percentage points. The full crosstabs are available here.